Based on stories coming out in the media, apparent President-elect Benigno “Noynoy” Aquino III will likely have a recycled Cabinet. But Aquino will use a second-hand Cabinet not as a cost-cutting measure in anticipation of the gargantuan budget deficit to be left behind by now Pampanga Congresswoman-elect Gloria Macapagal-Arroyo. Aquino’s recycling has more to do with paying political debts to those who have worked for and bankrolled his successful presidential campaign. Noynoy has already denied the so-called partial list of his Cabinet members circulating through text messages and picked up by the media. But if true (and it’s not farfetched), this may come as a disappointment especially to those who expected Aquino to overhaul and bring closer to the people the bureaucracy. After all, Aquino during the campaign aggressively depicted himself as the bearer of genuine change. But instead of surrounding himself with new people who have fresh ideas (or even old names but with unblemished and worthy track record), he may end up with people from the administrations of his late mother Cory (1986-1992), Fidel V. Ramos (1992-1998), and even Arroyo. Not only are these bureaucrats recycled, they also played major roles in crafting and implementing policies that hurt the poor and the economy. And while Aquino campaigned on a platform of good governance, some of the people he is considering are among those involved in some of the biggest corruption issues in the past. Media reports claim that Arroyo’s former Department of Trade and Industry (DTI) Secretary Johnny “Juan” Santos will be appointed as Secretary of the Department of Energy (DOE). Another former Arroyo high ranking official, former Department of Finance (DOF) Sec. Cesar Purisima is being considered as head of the DTI. Santos, as Gloria’s DTI Secretary, was the country’s main negotiator during the early stages of the talks for the controversial Japan-Philippines Economic Partnership Agreement (Jpepa), which various sectors and people’s organizations vigorously opposed for its harsh impact on livelihood, environment, sovereignty, and overall economic development. He’s also a former Nestlé Philippines chairman and chief executive officer (CEO). Purisima as DOF boss, on the other hand, served as one of the major players behind the hugely unpopular reformed value added tax (VAT) law (that raised the VAT rate from 10 percent to 12 percent and expanded to include oil and electricity, among others) in 2005. Santos and Purisima are members of the so-called Hyatt 10, a group of seven Arroyo Cabinet Secretaries and three bureau chiefs who resigned en masse in 2005 following the exposé of the “Hello Garci” scandal. 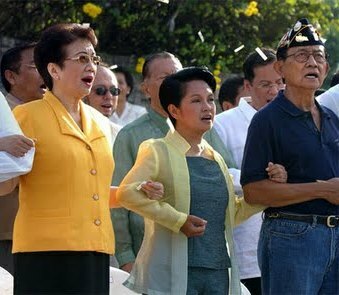 Other Hyatt 10 members who are in Aquino’s inner circle and reportedly will retake their old Cabinet posts are former Department of Education (DepEd) Secretary Florencio “Butch” Abad, who is LP vice president and Aquino’s campaign manager, former Department of Social Welfare and Development (DSWD) Secretary Corazon “Dinky” Soliman, and former Presidential Adviser on the Peace Process Teresita “Ging” Quintos-Deles. Another Hyatt 10 stalwart, former Department of National Defense (DND) Secretary Avelino “Nonong” Cruz is seen to head the Department of Justice (DOJ), although Aquino recently disclosed that he also offered the post to retired Supreme Court (SC) Chief Justice Reynato S. Puno but was turned down. Cruz as former Defense chief was part of the murderous Oplan Bantay Laya (OBL) military campaign of the Arroyo administration. Soliman and Deles, meanwhile, are key officials of the Caucus of Development NGO Network (CODE-NGO) which got accused of rent-seeking in the scandalous P1.47-billion Peace Bonds. The Aquino Cabinet will also supposedly include Pete Prado at the Department of Transportation and Communications (DOTC); Roberto F. Ocampo, DOF; Jun Simon, Department of Interior and Local Government (DILG); Carlos “Sonny” Domingues, Department of Agriculture (DA); Cesar Sarino, Social Security System (SSS); Ramon del Rosario Jr., Department of Foreign Affairs (DFA); and Philip “Popoy” Juico, Department of Agrarian Reform (DAR). Sonny Coloma, DOTC undersecretary under Ramos, is being considered as chief of the Presidential Management Staff (PMS). Del Rosario and Ocampo are both from the Makati Business Club (MBC) and served as Finance Secretaries under the Ramos administration. They were instrumental in the implementation of the destructive financial liberalization reforms (i.e. lifting of foreign exchange controls and speculative investment restrictions) during the mid-1990s. Juico, on the other hand, is the first Secretary of the DAR that implemented Cory’s Comprehensive Agrarian Reform Program (CARP) whose non-distributive stock distribution option (SDO) has fuelled continuing conflict in Hacienda Luisita and blamed for farmers’ deteriorating poverty. As DAR Secretary under Cory, Juico facilitated the referendums which led to Hacienda Luisita farmers signing a Memorandum of Agreement (MOA) for an SDO scheme with the Cojuangco-Aquino clan. Aquino, however, has yet to make an official announcement on his preferred Cabinet members except in the case of Soliman, Deles, and Coloma. He earlier said that he will form a selection committee that will screen potential Cabinet officials. The committee will be headed by his buddy and long-time personal legal counsel Paquito “Jojo” N. Ochoa, which word has it is the next Little President (aka Executive Secretary). His choice of people to help him run the government will speak a great deal about the policy direction that Noynoy’s administration would likely take during its term. And so far, the possible composition of his Cabinet indicates that the country will probably see more of the same flawed policies implemented by Cory, FVR, and Gloria that have to a large extent failed to address joblessness, landlessness, hunger, and poverty. These are the same people who have been part of the corrupt and repressive regimes of the past. And today, we might end up taking President Noynoy’s “daang matuwid” (righteous path) with them.